New Zealand’s first on-road testing of fully autonomous vehicles will change up a gear later this year with the inclusion of the first locally designed and built vehicle. The Ohmio LIFT will hit the road in a new phase of the trials on private roads at Christchurch Airport. Ohmio Automation Chief Executive Stephen Matthews says this first build of the self-driving Ohmio LIFT is a significant milestone for the company. 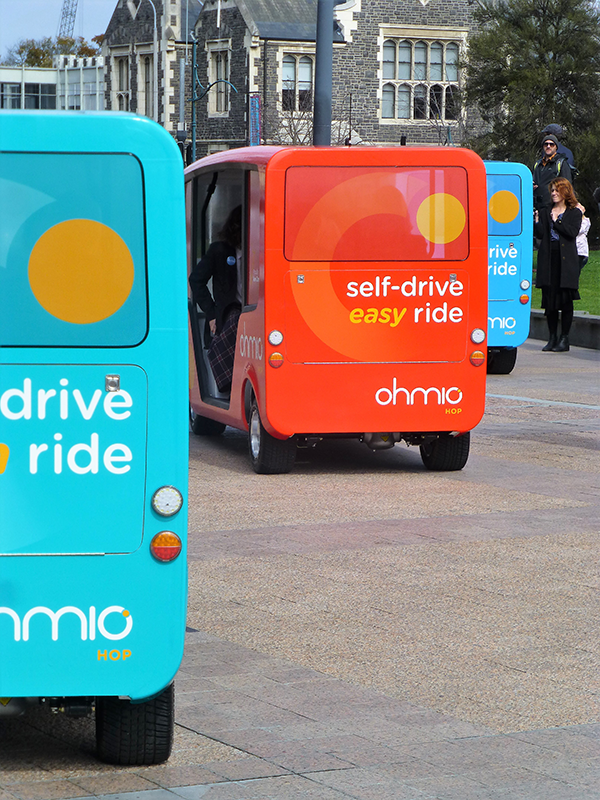 Mr Matthews says the self-drive Ohmio vehicles are designed to operate on predetermined repetitive routes. The system created allows vehicles to be deployed quickly, with a mapping capability which means the vehicle can learn its course and improve performance using artificial intelligence [AI] to repeat the charted course over and over. Multiple Ohmio vehicles can also “platoon” forming a connected convoy, which makes Ohmio a scalable solution, responding to demand to operate as an efficient and safe virtual tram. Christchurch Airport General Manager Corporate Affairs, Michael Singleton, says the second phase of the trial which began more than a year ago will allow the New Zealand vehicle to be proven and licenced. “Our joint fully autonomous vehicle trial continues, with the Ohmio LIFT proving this country is able to design and construct a vehicle made for our conditions,” he says. “Collaborating with Ohmio means we have a technology partner and producer which is able to take the learnings from the trial to date and then adapt and enhance the vehicle to New Zealand needs. The focus of the trial remains on autonomy rather than a particular vehicle, and we look forward to continuing to explore how autonomous shuttles might play a part in our future at our airport. “Christchurch Airport’s growing reputation as a test bed for innovation, and in particular autonomy, is growing, because we combine the right physical environment for safe testing with understanding of technological advances,” he says. There are currently three hot topics in transport and mobility, connected and automated vehicles and driving; mobility as a service and the sharing economy; and air quality. The emergence of electrically powered automated shuttle buses for city centres, central business districts, campuses, airports, shopping malls, hospitals, etc. promise to harness connected automated vehicles to enable mobility as a service (as they can fulfil the first and last mile requirements) and contribute to improved air quality. This is why there is increasing interest in identifying the path to full-scale deployment for services based upon these vehicles. The recent commissioning of even more automated shuttle bus demonstrations around the world illustrates how much interest they are now attracting. Two companies have been at the forefront of these demonstrations, Navya and EasyMile both manufacture vehicles and both deserve much credit for the way that they are promoting the advantages of these shuttles. Navya have over 30 vehicles in operation in various demonstrations around the world including Lyon, Doha, Bordeaux, Ann Arbor, Perth, London, Christchurch, Sydney and Melbourne. Similarly, EasyMile has nearly 60 operational vehicles that have been used in 130 projects, carrying 210,000 passengers, in over 20 countries around the world. EasyMile vehicles can be found in European, North American, Asian and Australian cities including Nice, Darwin, Sohjoa (Finland), San Sabastian, Singapore, Dubai, Lausanne, Taipei, and Tallinn. “We consider Navya and EasyMile to be the pioneers in self-driving shuttles. They were the first to explore the space and really set the bar for the industry to start. Setting the bar is harder than raising it and they deserve the credit and acknowledgement for being the first.” commented Mohammed Hikmet, founder of HMI. What the headlines suggest and what really happened are quite different. During the trip, the Navya encountered an articulated delivery truck stopped in the street. The driver was trying to reverse his trailer into an alleyway. The shuttle bus stopped a reasonable distance from the truck and waited for it to move. While the Navya was stationary the reversing tractor unit of the truck very slowly, caught the front of the shuttle causing some minor damage. With a shuttle with a human driver, there would have been the option of reversing to avoid the incident. Clearly without a driver this was not one of the programmed options. The trials are designed to identify this type of situation and to demonstrate the potential for such vehicles. To blame the shuttle or Navya for this situation is disingenuous and about as reasonable as blaming the owner of a legally parked car if another car happens to bump it. Clearly there is still much to learn about the operation of these vehicles from the policy and regulation perspective which is why such demonstrations are so important as they help inform understanding of the opportunities and challenges of such an innovative mobility advance. So, is the time now right to change our approach to demonstrating these vehicles? The misreporting of the Las Vegas incident could have a negative impact on the market and could even delay deployment if officials delay regulations that will allow real on-street operations. As with the introduction of any new system, requiring regulation and operational changes, trials in various places and under different jurisdictions is the standard approach to foster understanding and prove the capabilities. This is normal as some authorities are keen to lead while others may be constrained by local circumstance or prefer to follow. Australia and New Zealand are hosting trials and demonstrating real determination to become world leaders in shuttle based service deployment. In February 2017, the Northern Territory (NT) Government of Australia launched an eight-month trial at the main recreational area of Darwin. The Darwin Waterfront is a Precinct by the ocean made up of retail shops, restaurants, beach and lagoons and a cruise terminal. The EasyMile Autonomous Electric Vehicle links daily Indo Pacific Marine with Stokes Hill Wharf, a recreational area made of restaurants located 1km away from the main attractions of the Waterfront. The NT government is interested in understanding the use of Autonomous Vehicles to better connect areas of interest for the population starting with this last mile connection where regular public transport solutions could not be justified due to the short distance. This trial also aimed at testing the EZ10 in an open road environment crossing cars, trucks, bikes and bicycles. The project is also a great environment for humidity (exceeding 80%) and high temperature (exceeding 30°C) testing. The trial has succeeded in helping evolve local regulations; better management of the state insurance to cover the use autonomous vehicles; and raised public awareness for uses of autonomous vehicles in open road environments. The NT government is now looking to expand the trial to other locations and integrate larger number of shuttles in Darwin. HMI Technologies are coordinating trials in Sydney, Melbourne and at Christchurch Airport. While each of these trials is using Navya vehicles, the trials are not operated by Navya, but by HMI and their partners. HMI are agnostic about the technology and the demonstration platforms being used. An HMI led trial has also been launched in Sydney, New South Wales. Transport New South Wales reported on the Sydney launch. “The future of automated vehicles has arrived, with Transport Minister Andrew Constance and Roads, Maritime and Freight Minister Melinda Pavey launching the first trial of a driverless shuttle bus in NSW. The Government has joined forces with HMI Technologies, NRMA, Telstra, IAG and Sydney Olympic Park Authority, to conduct a two-year trial of the state’s first automated Smart Shuttle at Olympic Park. “The trial, showcases a small part of our much bigger vision for a technology-enabled transport future,” Mr Constance said. Mrs Pavey said she expects office workers at Sydney Olympic Park to be using the automated shuttle next year, becoming the first to test-ride this new technology before we start seeing it on our roads. “This trial is not only about automated vehicles, it is also about connectivity,” she said. “We want to use the trial to help develop the systems that will enable automated vehicles to be connected to our infrastructure, like traffic lights and to our customers through their devices and applications. It’s the combination of connectivity and automation that will provide the safety and mobility benefits we are looking for. “There is still some way to go before automated shuttles become common place on Australian roads, but as a Government we are ready to take the next step and from here all sorts of possibilities open up for transport in NSW.” Legislation to allow to trial to go ahead has been introduced into Parliament. In a Victorian first, a driverless shuttle bus has begun operations around La Trobe University’s Bundoora campus in a trial that will help shape the future of public transport. The ‘Autonobus’ (surely the coolest name so far for these shuttles) will operate along Science Drive, at first in test mode, then from March 2018 picking up passengers from car parks and bus/tram interchanges and allowing them to hop off close to their destination. The RACV-supported and HMI coordinated trial will run until July 2018, looking at all aspects of safety, operations, passenger experience and integration with other forms of transport. Made by Navya, the Autonobus is equipped with advanced sensor systems that can detect potential collisions with very fast response times. It operates without a driver, but for the trial period it will be supervised by an operator at all times, allowing the trial team to monitor the vehicle and how it interacts with its environment, and to measure passenger acceptance and behaviour. With human error contributing to more than 90 per cent of crashes, automated vehicles have enormous potential to reduce the road toll, and to help those with limited mobility travel more easily. RACV’s general manager of public policy and corporate affairs, Bryce Prosser, says the project will explore world-leading driverless technology. “This is an exciting opportunity to look into the future of transport and how autonomous vehicles can be used to meet passenger demand and complement existing transport options,” Mr Prosser says. Minister for Roads and Road Safety Luke Donnellan says the project shows that Victoria is at the forefront of automated vehicle technology. The first New Zealand trial of a fully automated electric vehicle was launched earlier this year. It is an initiative from HMI Technologies and Christchurch International Airport to help answer key questions about how these vehicles could operate in New Zealand. The trials are mainly conducted on the Christchurch Airport campus, starting on private roads with no public presence, but with the long-term aim of moving to public roads once the safety case has been made and all regulatory approvals are in place. Christchurch Airport GM Corporate Affairs, Michael Singleton, says the airport's interest in this trial centres on plans for linking key areas around the airport campus. The trial partners are working with University of Canterbury researchers and developers, who help design and undertake the trials. Christchurch City Council are also using the trials to raise awareness of how these vehicles and other technological developments may alter the way cities work in the future. The Ministry of Transport and New Zealand Transport Agency are also involved in the trials. Entirely separate from the local demonstration coordination teams and trials, the HMI research and development group in Auckland has been developing their own technology approach to automated vehicles. In July 2016, the company identified that the rapid advancement of sensors, cameras, data analytics and wireless communications created a convergence with the transformative technology of autonomous vehicles. HMI decided to create its own automated vehicle using in-house technology development aimed at the last mile automated vehicle market. Two independent competing in-house research and development teams worked on both hardware and software approaches to achieve the project. In May 2017, the two approaches were evaluated and the best of each combined to form a technology platform for automated buses. To demonstrate these capabilities, HMI developed the Ohmio range of vehicles and launched these in a technology (rather than product) launch in Christchurch, New Zealand in September 2017. The ohmio automated driverless vehicles can platoon (intelligent convoying) and interact with traffic signals and roadside infrastructure. The vehicles use existing propriety sign controller technology, that HMI already manufacture, effectively connecting the vehicles to traffic control and management infrastructure devices. The vehicles demonstrated at the launch can use virtual routes from a central control centre via road side units, which enables the local authorities to regain control of their road network. The Ohmio vehicles are enabled by HMI technologies which is at the forefront of international intelligent transport systems development and deployment. Stephen Matthews, Chief Executive, Ohmio Automotion Ltd is responsible for this exciting emerging market opportunity and commented “The Ohmio range is set to join the shuttle market during 2018 when production vehicles will become available”. So why Australia and New Zealand? “Being in New Zealand offers us a formidable advantage,” explained Mohammed Hikmet. “The testing and deployment of autonomous vehicles elsewhere is slowed down by legislation or requires special permits. Here in New Zealand, the government already allows for testing of driverless vehicles. That gives ohmio an advantage as we scale up and develop our technology, especially as we understand regulations here and in Australia.” Connected automated vehicles like ohmio will deliver real service benefits, become a key element of Mobility as a Service, which promises to break down the transport silos that currently exist and provide users with safe and seamless travel and help address the air quality issues in our cities. potential greater benefits and impacts of having vehicles from different suppliers operating in the same demonstrations. One initiative that should help get different vehicles operating in the same area is the newly signed Memorandum of Understanding for cooperation between HMI, the Land Transport Authority in Singapore and the world leading GoMentum Station test facility in California. EasyMile are already partners with GoMentum Station, so the future for cooperation looks bright. Working together makes sense as the various service providers and manufacturers seek to establish the market for electric shuttles and to help improve and modify transport and mobility for all. The services enabled by these vehicles promise to harness connected automated vehicles to enable mobility as a service and contribute to improved air quality.